Corporate Events and Team Building Workshops. Aerial Trapeze Academy is the only company in the United States that has the availability for the public to rent complete circus programs. Our full program includes: flying trapeze, aerial acts, ground acts, costumes, make-up, music, and lights, stilts, fire juggling, fire eating. The program will be fully staffed by professionals whom all have circus performance experience. Site Survey in Advance-View proposed location to insure appropriate space 115 x 75 feet x 34 foot tall, check ground elevation, and underground utilities. Setup and breakdown of flying trapeze on same day. 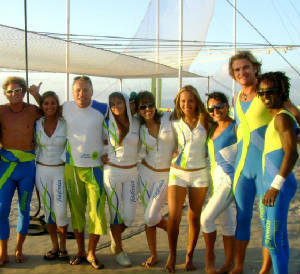 Instructors-professional staff and trapeze artists. Lights-Lighting for day or night flying and shows. Interactive Bill Board-Advertise your company or event by hanging signage on or around the rig. The trapeze dimmentions can be customized to fit most venue sites. The ground can be asphalt, sand, or grass.